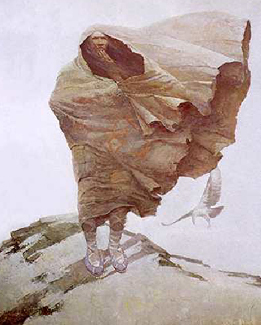 Winter, by N. C. Wyeth. When did the first people arrive in the Americas? Where did they come from? How did they survive? These are the big questions concerning American Indian origins, but no certain answers exist and considerable debate surrounds the alternative scenarios offered by modern science. Exciting new discoveries are being made in archeology, biological anthropology, linguistics, human genetics, geology, paleoclimatology, and other disciplines, so we may soon know the answers to these questions. In the meantime, we are left to sort through a large body of evidence and interpretations in an effort to sketch the most likely scenario. The movement of people into the Americas was part of a global expansion of human populations out of Africa, Europe, and Asia that took place before the end of the last Ice Age (also known as the Pleistocene epoch). This expansion resulted in the occupation of every major landmass in the world except Antarctica. Modern DNA studies, studies of American Indian languages and tooth shape, and archeological evidence all point to the Sub-arctic and Arctic regions of western Asia as the place where populations migrating into the Americas originated. Human groups entered western Asia after 28,000 B.C., so the first American immigrants must have arrived after that date. At the height of the last Ice Age, about 18,000 B.C., glacial ice more than a mile thick covered much of northern North America, northern Europe and Russia, and Siberia. The vast amount of water frozen in these glaciers lowered sea levels by as much as 300 feet. This produced continental coastlines different than those drawn on today’s maps. One difference important to the initial peopling of the Americas was the existence of an exposed land mass, roughly 1,000 miles wide, that connected Siberia with Alaska where the Bering Strait now exists. Asiatic hunters able to cope with cold environments reached central Siberia by 27,000 B.C. Many archeologists believe that the descendants of those people migrated across the Bering Strait landmass—known as Beringia—to reach North America. Archeologists refer to these first American migrants as Paleoindians. 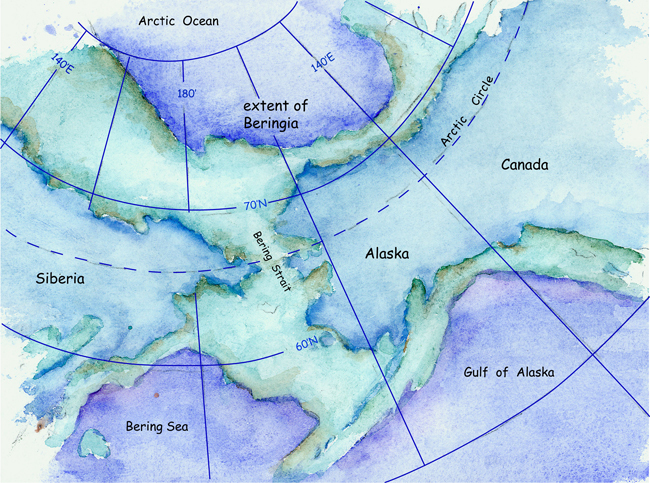 Extent of Beringia around 20,000 years ago, by Jane Kellett (Arkansas Archeological Survey). Beringia was last exposed from 28,000 B.C. to about 10,000 B.C. Exceptionally cold climates prevented human settlement in much of the region from 21,000 to 17,000 B.C., but conditions later improved. The earliest evidence for human occupation in western (Asiatic) Beringia dates to around 12,000 B.C. Sites of a similar age and containing similar artifacts are found in eastern (Alaskan) Beringia. Hypothetical coastal (purple) and interior (orange) routes of Paleoindian migration into North America, by Jane Kellett (Arkansas Archeological Survey). Upon reaching eastern Beringia, Paleoindians had to contend with North American glaciers. The Cordilleran ice mass extended from the northern Rocky Mountains to the Pacific Ocean coast. The Laurentide ice mass extended from Beringia eastward, covering much of Canada and the northern United States. These two ice masses collided, blocking overland passage from Beringia into North America until about 11,500 B.C. A route along the Pacific coast of North America opened earlier, around 14,500 B.C. Archeologists believe Paleoindians could have traveled along either route. The most likely scenario for the peopling of the Americas involves a sequence of small migrations entering North America at the end of the last Ice Age, via overland and coastal routes. Computer simulations suggest that these founding populations could have moved swiftly across North, Central, and South America. Some of these immigrants developed a new adaptation based on hunting large Ice Age mammals, including mammoths and mastodons. Archeologists name them the Clovis people, after the site where their distinctive spear points were first excavated and studied. The earliest Clovis sites date to about 11,500 B.C. 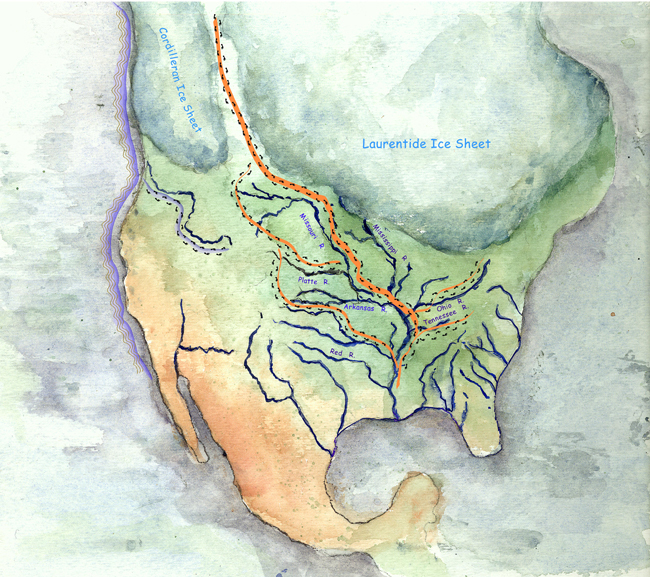 The distribution of Clovis artifacts indicates that these nomadic people followed major tributaries of the Mississippi River, arriving in the Mid-South shortly before 10,500 B.C. In the following section, we’ll examine Southeastern Clovis cultures more closely. 2004 The Great Journey: The Peopling of Ancient America. Gainesville, University Press of Florida. 2002 The Early Settlement of North America: The Clovis Era. Cambridge, Cambridge University Press. 2004 Entering America: Northeast Asia and Beringia Before the Last Glacial Maximum. Salt Lake City, University of Utah Press.